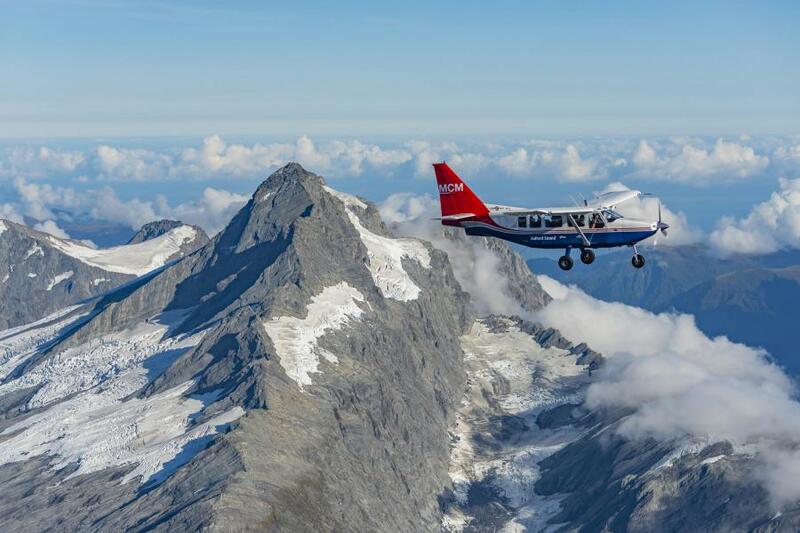 Small aircraft carry scientists high above the Southern Alps to survey glacier changes. Every March, glacier “watchers” take to the skies to photograph snow and ice clinging to high peaks along the length of New Zealand’s Southern Alps. This flight needs to happen on cloud-free and windless days at the end of summer before new snow paints the glaciers white, obscuring their surface features. Each year, at the end of summer, scientists monitor glaciers along New Zealand’s Southern Alps. The Franz Josef glacier advanced during the 1980s and 1990s but is now retreating. Glaciers are a beautiful part of New Zealand’s landscape, and important to tourism, but they may not be as prominent in the future. This stored component of the freshwater resource makes contributions to rivers that are used for recreation and irrigation of farm land. Meltwater flowing from glaciers around Aoraki/Mt Cook into the Mackenzie Basin feeds important national hydroelectricity power schemes. Seasonal meltwater from glaciers can partially mitigate the impacts of summer drought. This buffering capacity may become more crucial if the eastern side of New Zealand’s mountains become drier in a changing climate. When Trevor Chinn began studying New Zealand’s 3,000 or so glaciers in the 1960s, he realised monitoring all of them was impossible. He searched for cost-effective ways to learn as much as he could. This resulted in comprehensive glacier mapping and new snow and ice observations when similar work was dying out elsewhere. Mapping of all of the world’s glaciers – nearly 198,000 in total – was only completed in 2012, yet Trevor had already mapped New Zealand’s ice 30 years earlier. Octogenarian Trevor Chinn still participates in the snowline flights every year to support younger scientists. In addition, he wanted to understand how snow and ice changed from year to year. Trevor decided to do annual glacier photographic flights, looking for the end-of-summer snowlines – a feature about half way between the terminus and the top of a glacier where hard, blue, crevassed glacier ice usually gives way to the previous winter’s snow. The altitude of this transition is an indicator of the annual health of a glacier. The Southern Alps end-of-summer snowline photo archive, produced by the National Institute of Water and Atmospheric Research, is a remarkable long-term record. Our colleagues Lauren Vargo and Huw Horgan are leading the effort to harness this resource with photogrammetry to deliver precise (metre-scale) three-dimensional models of glacier changes since 1978, building directly on Trevor Chinn’s work. Glaciers respond to natural variability and human-induced changes, and we suspect the latter has become more dominant for our region. During the 1980s and 1990s, while glaciers were largely retreating in other parts of the world, many in New Zealand were advancing. Our recent research shows this anomaly was caused by several concentrated cooler-than-average periods, with Southern Alps air temperature linked to Tasman Sea temperatures directly upwind. The situation changed after the early 2000s, and we postulated whether more frequent high snowlines and acceleration of ice loss would occur. Since 2010, multiple high snowline years have been observed. In 2011, the iconic Fox Glacier (Te Moeka o Tuawe) and Franz Josef Glacier (Kā Roimata o Hine Hukatere) started a dramatic retreat – losing all of the ground that they regained in the 1990s and more. In a series of ice collapses, New Zealand’s Fox Glacier retreated by around 300 m between January 2014 and January 2015. How New Zealand’s glaciers will respond to human-induced climate change is an important question, but the answer is complicated. A recent study suggests human-induced climate warming since about 1990 has been the largest factor driving global glacier decline. For New Zealand, which is significantly influenced by regional variability of the surrounding oceans and atmosphere, the picture is less clear. To assess how human-induced climate influences and natural variability affect New Zealand glaciers requires the use of climate models, snowline observations and other datasets. Our research team, with support from international colleagues, are doing just that to see how Southern Alps ice will respond to a range of future scenarios.